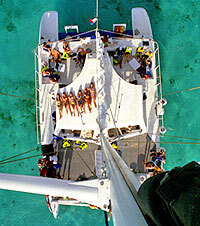 There is no better way to enjoy the sun, snorkeling and sailing than on the beautiful 53' Manta Catamaran. Cruise the Cozumel coastline, catching some of that warm Caribbean sunshine, on your way to some of the best snorkeling coral reefs in Cozumel. Depending on which day you choose, you can snorkel at 2 or 3 exciting sites. Palancar and Columbia reefs are probably the most famous sites in Cozumel, and for good reason. Shallow, beautiful reefs, teeming with tropical sea life, and famous for sea turtle sightings, these are maybe the best of the best. Paradise Reef is also a beautiful snorkeling site, shallow and colorful, and the sunken ship adds a whole new exciting dimension to your snorkeling experience! After snorkeling, set sail for the trip home, and dig into the open bar, sipping cocktails and drying off in the warm Caribbean sunshine. A great trip in Cozumel! Enjoy sailing on the blue Caribbean Sea, in the most spacious catamaran in Cozumel! Snorkel on Cozumel's two most beautiful coral reefs - Palancar Reef and Columbia Reef! Other days, you can experience snorkeling on a sunken ship, as well as the famous Paradise Reef! Use the Stairway to the Sea for the easiest entry and exit from the water in Cozumel! Where: The Aqua Safari pier downtown, almost in front of Hotel Vista del Mar. Pick-up is also available at the following hotel piers: Cozumel Palace, Park Royal, El Cid La Ceiba and Presidente. Additional pier Pick-up is available at the hotel pier for Wyndham, Iberostar, Allegro, and Fiesta Americana guests for the Palancar trip only (not the Paradise trip). How Long: 5.5 Hours for Palancar & Columbia, 3.5 Hours for Paradise, Dzul Ha and Sunken Ship. Kids: All ages are welcome. Kids prices apply to kids age 3-12. Kids under age 3 are free. Notes: The bar opens up after snorkeling for snorkelers. Non-snorkelers can partake all day long. $2.00 per person government marine park tax will need to be paid at the marina upon departure. Taxis are lined up waiting for you as you get off the ship. Very easy. Should cost only about $5.00 USD from Intl and Puerta Maya piers.